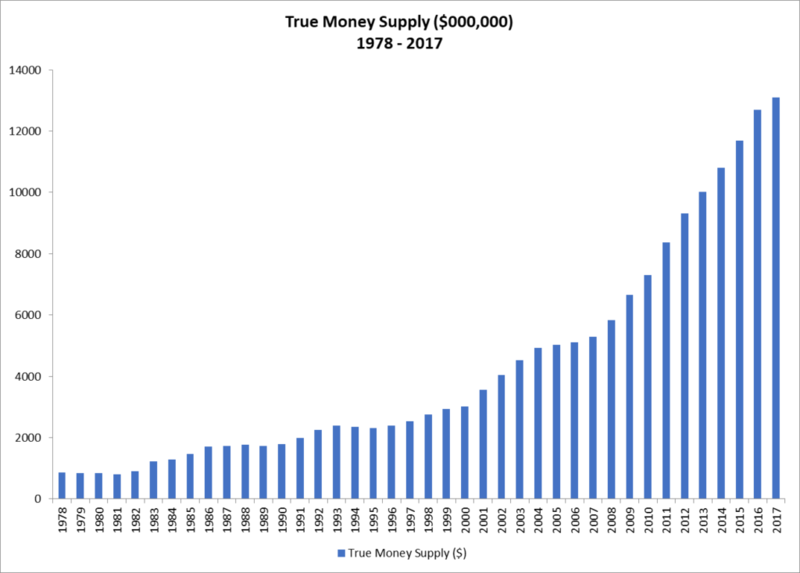 What Does The Dramatic Deceleration In The Growth Of The True Money Supply Mean For Real Estate Investors? On February 5, 2018, Jerome Powell was sworn in as the 16th Chair of the Board of Governors of the Federal Reserve System. Powell succeeded Janet Yellen, who was sworn in as Fed Chair on February 3, 2014, a little more than a month after the Federal Reserve ended its asset purchase program commonly referred to as Quantitative Easing or “QE” for short. 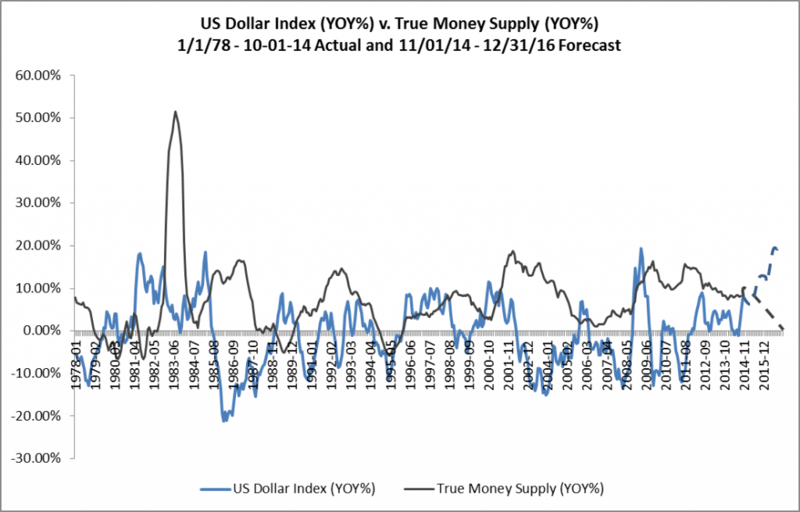 In November of 2014, in response to the end of Quantitative Easing and Janet Yellen’s appointment as Fed Chair, RealForecasts.com published a post titled How Will The End Of Quantitative Easing Impact The True Money Supply Growth Rate? 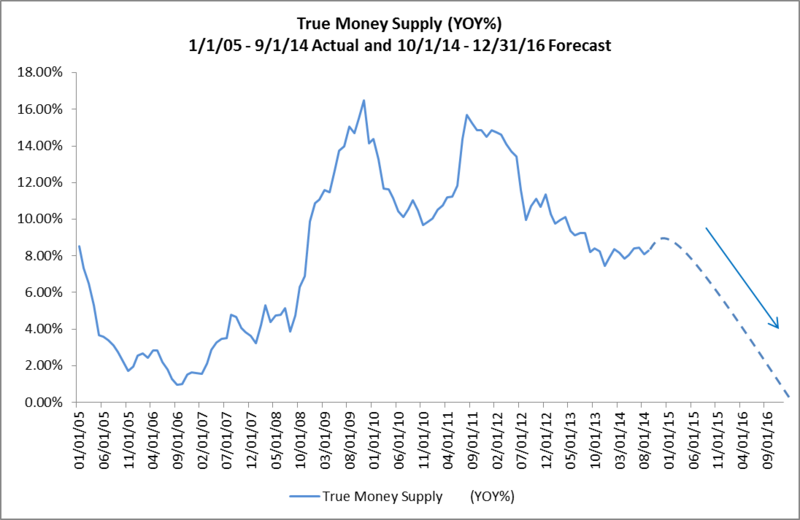 In that post, RealForecasts.com forecasted a deceleration in the growth of the True Money Supply (TMS) from about 9% year-over-year (YOY) at the beginning of 2015 to 0% YOY at the end of 2016. This post will update the actual growth rate of TMS since the end of QE and explain what it means to real estate investors. It will also provide some possible strategies that real estate investors can adopt in response to changing economic and real estate market conditions. As suggested above, the Federal Reserve ended Quantitative Easing in December of 2013. Two years later, in December of 2015, the Fed began raising the Fed Funds Target Rate — with an initial increase from .25% to .50%. This was the first time that the Fed had raised the Fed Funds Rate since June of 2006. In December of 2016, and in March, June and December 2017, the Fed continued to increase the Fed Funds Rate in 25 bps increments to its current rate of 1.50%. Moreover, on September 20, 2017, the Fed announced that it would begin to reduce the $4.5 trillion balance sheet that it had amassed during QE by selling $10 billion of assets each month from October through December of 2017, $20 billion per month from January through March of 2018, $30 billion per month from April through June of 2018, $40 billion per month from July through October 2018 and $50 billion per month from October through December of 2018 for total sales of $450 billion by the end of 2018. The Fed also announced plans to raise the Fed Funds Rate three more times during 2018 to end the year above 2 %. 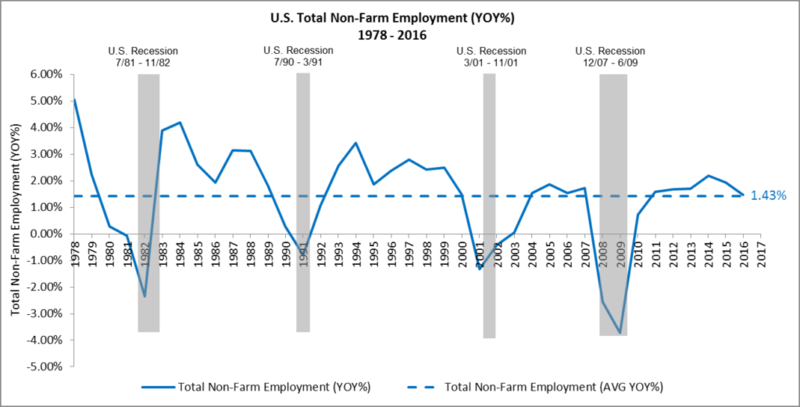 In response to the Fed’s increasingly tighter monetary stance, the growth rate of TMS has decelerated dramatically, from 11.15% YOY in October of 2016 to 3.10% YOY in December of 2017. This is the same magnitude of deceleration that RealForecasts.com had forecasted in November of 2014, but because the Fed unexpectedly delayed its decision to begin raising the Fed Funds Rate and reduce its balance sheet, it occurred about a year later than expected. 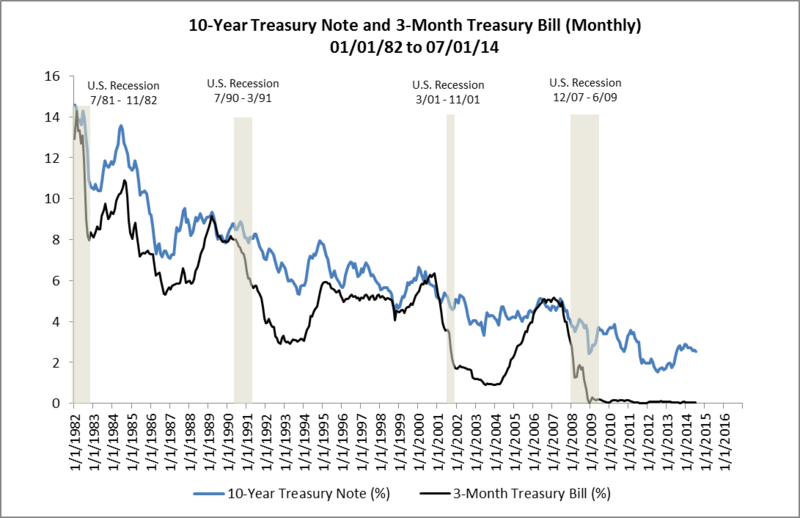 Note that this is the most dramatic deceleration during a period of monetary tightening since TMS decelerated from 9.54% YOY in October of 2004 to 1.71% YOY in November of 2005. (See Figure 2.) 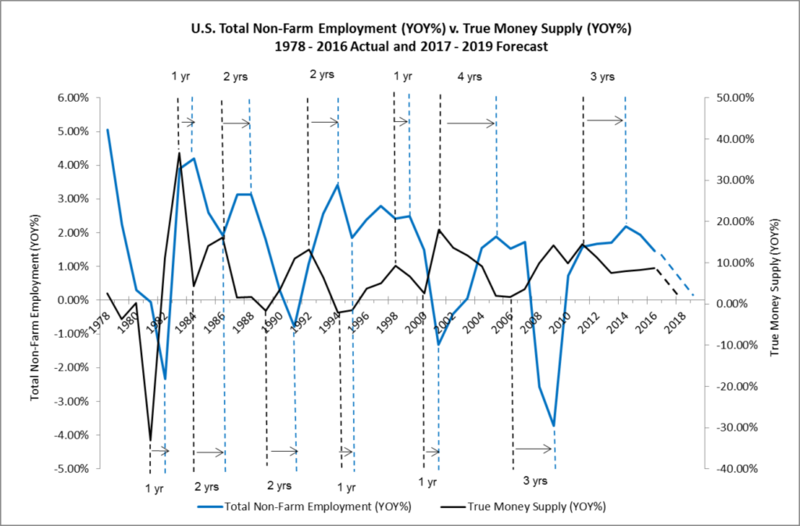 In that case, after accelerating slightly from December of 2005 to April of 2006, the TMS growth rate decelerated to its cyclical low of ,98% YOY in September of 2006. If the Fed sticks with its plans to continue to both raise the Fed Funds Rate and reduce its balance sheet during 2018, it’s easy to see that the growth of TMS could grind to a halt and even begin to contract later this year. 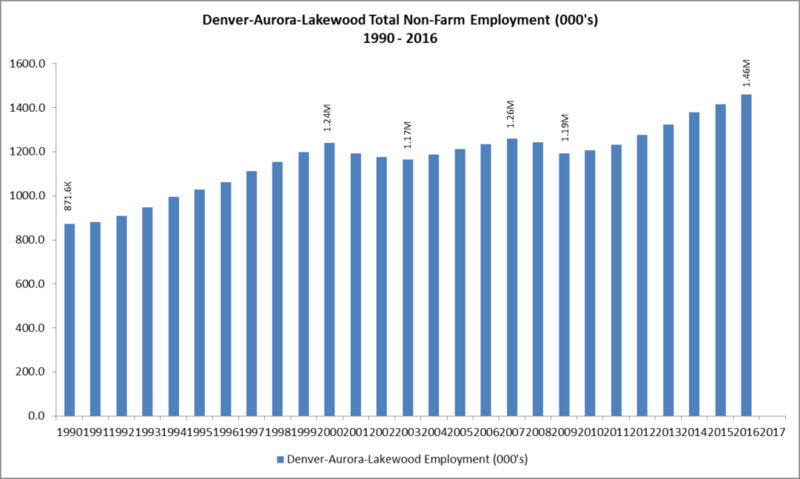 In previous posts such as Where Are The Employment Markets In Their Cycles? 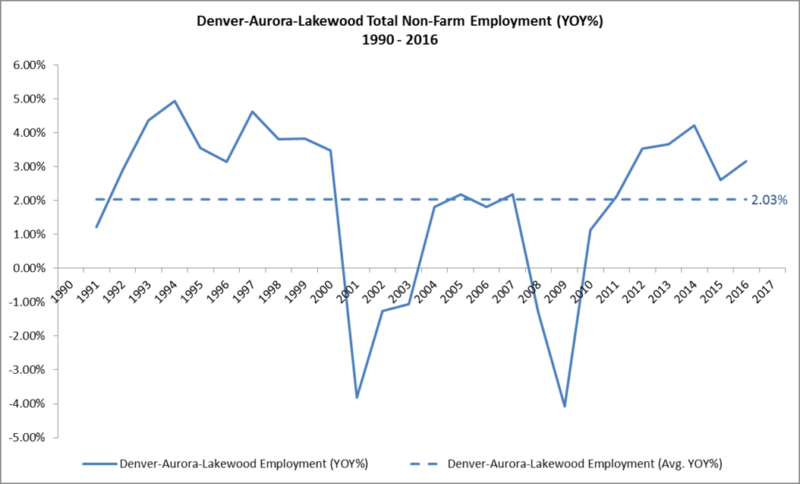 and Where Will Commercial Real Estate Returns Go From Here?, RealForecasts.com demonstrated that changes in the TMS growth rate can accurately forecast changes in the growth rate of Total Employment. 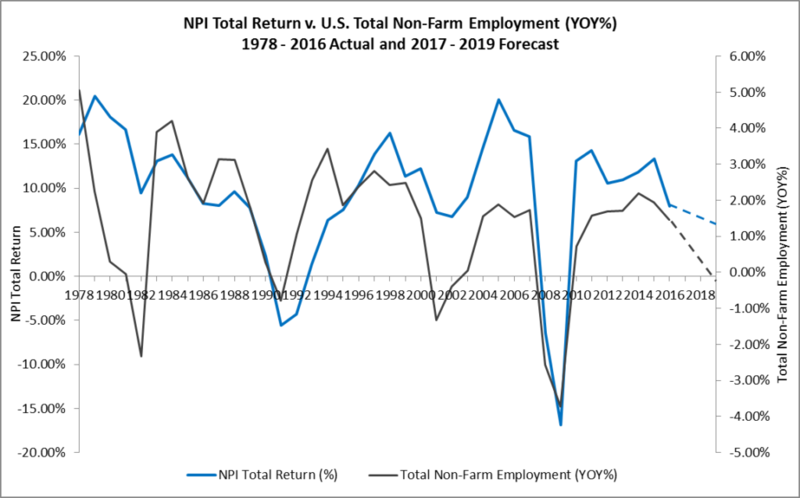 Further, because of the the strong correlation between the YOY growth rate of Total Employment and the annual returns from private-market real estate equity investments, as reflected in the NCREIF Property Index (NPI), changes in Total Employment can help us to forecast changes in the NPI. Figure 3 shows the acceleration and deceleration of the expansion — and sometimes contraction — of TMS dating back to 1978. Note that in each TMS expansion and contraction cycle, the Fed maintained a tight policy stance until a credit and liquidity crisis occurred. Also, an economic recession typically occurred shortly after the credit and liquidity crisis. Finally, of particular note is the length of the loose policy stance in the current cycle and, until recently, the slow pace of tightening since the end of QE. 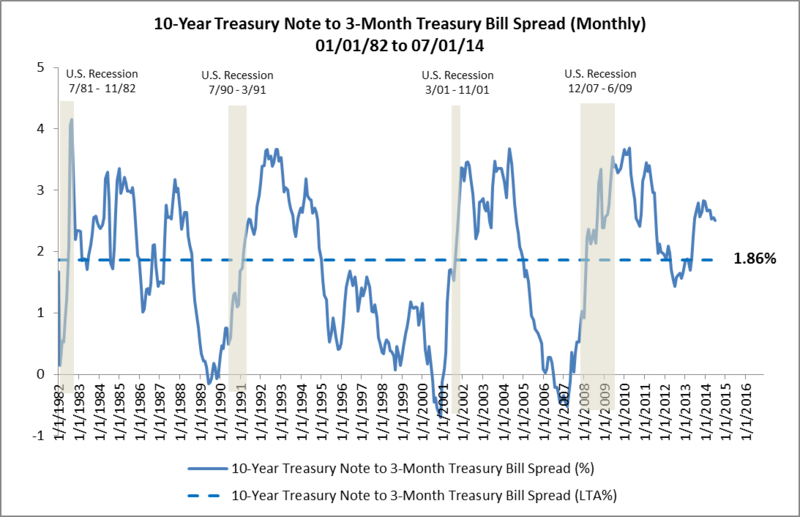 RealForecasts.com expects that the growth of TMS will continue its downward trend in the months ahead, as the Federal Open Market Committee continues to raise the Fed Funds Target Rate and reduce its balance sheet. Based upon the current trajectory of this trend, and the Fed’s current policy stance, it looks like the next credit and liquidity crisis could occur during the second half of 2018, with an economic recession and real estate market downturn to follow. Of course, this forecast could change if the Fed changes its policy stance or if the commercial banks change their pace of lending activity. In the meantime, real estate investors would be wise to take advantage of the still robust capital markets environment to begin selling some of their under-performing and less-strategic assets and using the proceeds to reduce the leverage on their remaining properties and portfolios. By “dealing from the bottom of the deck” and reducing leverage, they will be improving the risk profile of their portfolios in anticipation of — and not in reaction to — the next credit and liquidity crisis, economic recession and real estate market downturn. This entry was posted in Economics, Investment Strategy, Market Forecasts, Money, Real Estate on February 21, 2018 by Jeff Peshut. Where Are The Real Estate Credit Markets In Their Cycles? In its last post, Can Real Estate Investors Manage Through The Boom/Bust Cycle?, RealForecasts.com presented alternative strategies that real estate investors can employ to manage through the boom/bust cycle, depending upon where the real estate capital markets and real estate property markets are in their cycles. That of course begs the question, “Where are the real estate capital markets and real estate property markets in their cycles today?” This post will address the question of where one sector of the real estate capital markets — the real estate credit markets — are in their cycles. 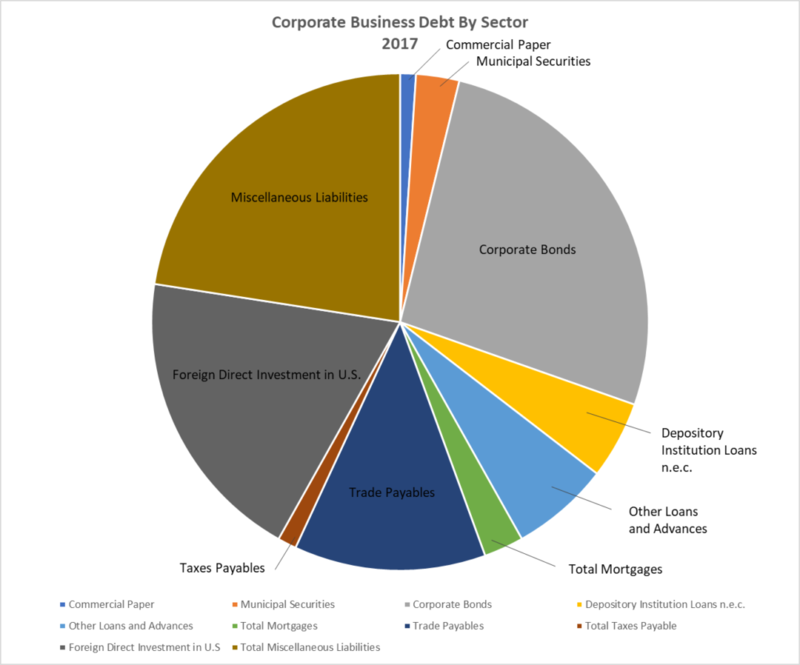 The real estate credit markets can be divided into three separate categories — commercial mortgage debt, multi-family residential mortgage debt and and single-family residential mortgage debt. RealForecasts.com uses changes in the level of mortgage debt outstanding to track the cycle for each category. 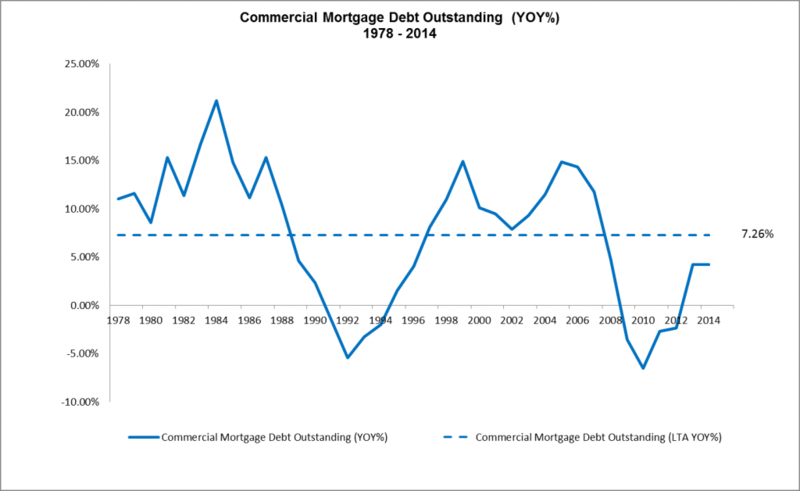 For example, Figure 1 shows commercial mortgage debt outstanding from 1978 to 2014. 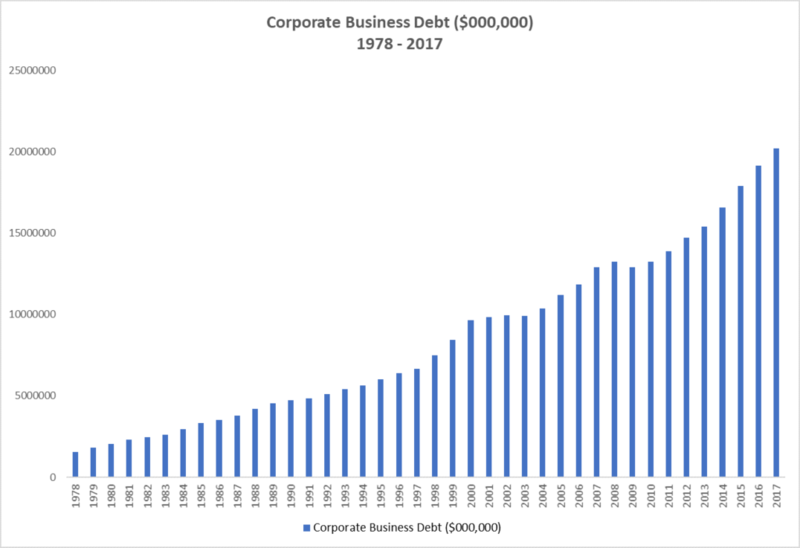 The last cycle for commercial mortgage debt began in 1995 at a level of $733.8 billion before peaking in 2008 at a level of $2.58 trillion. As the supply of credit contracted after the Great Financial Crisis, commercial mortgage debt outstanding also contracted, reaching a trough of $2.23 trillion — and the end of the cycle — in 2012. 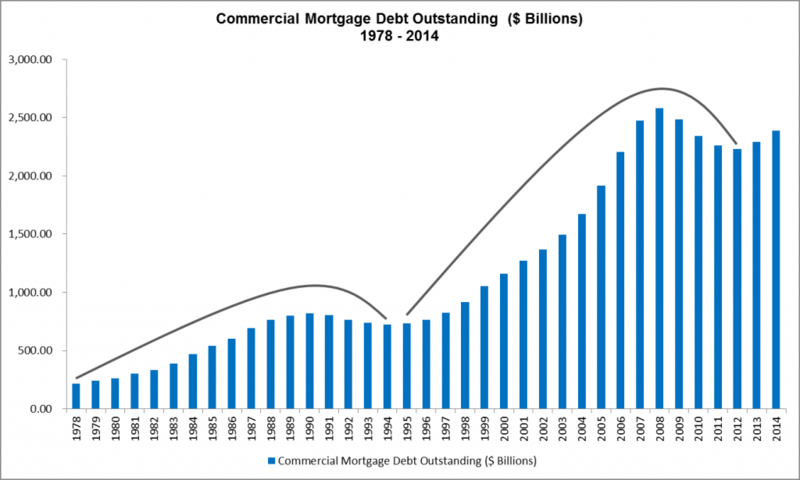 Since the start of the current cycle in 2013, commercial mortgage debt outstanding has increased to $2.39 trillion, but has yet to recover to its 2008 peak. In terms of a commercial mortgage, there are some companies out there who can take the mortgage note off your hands and put your commercial property portfolio for sale. This way, you can make a bit more money to go towards your business. 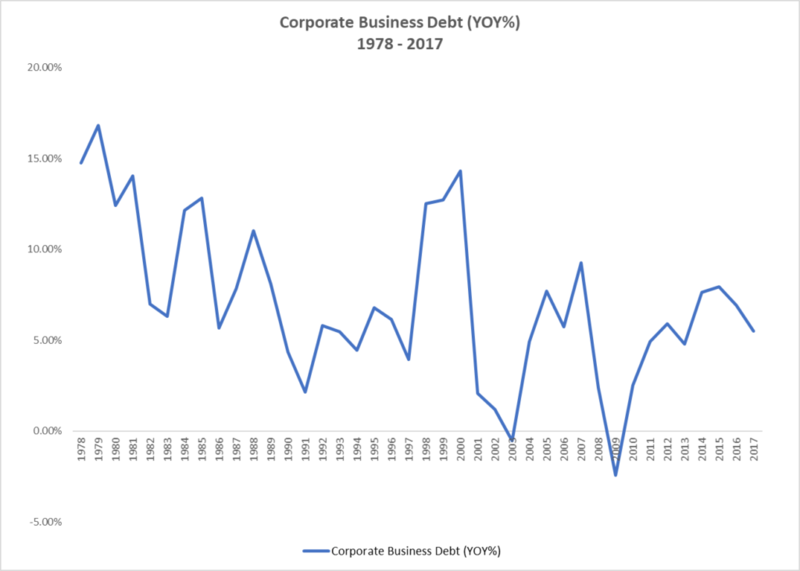 The year-over-year growth rate of commercial mortgage debt outstanding since 1978 is shown in Figure 2. The rate of growth averaged 7.26% from 1978 to 2014. but accelerated to almost 15% in both 1999 and 2005. Figure 3 presents multifamily mortgage debt outstanding between 1978 and 2014. The last cycle for multifamily mortgage debt began in 1994 at a level of $268.2 billion and increased to a peak of $855.2 billion in 2009. After the Great Financial Crisis, however, multifamily mortgage debt outstanding decreased only slightly to $852.2 billion in 2010. Multifamily mortgage debt began increasing again — and the new cycle began — in 2011 and had reached $998.6 billion as of the end of 2014. 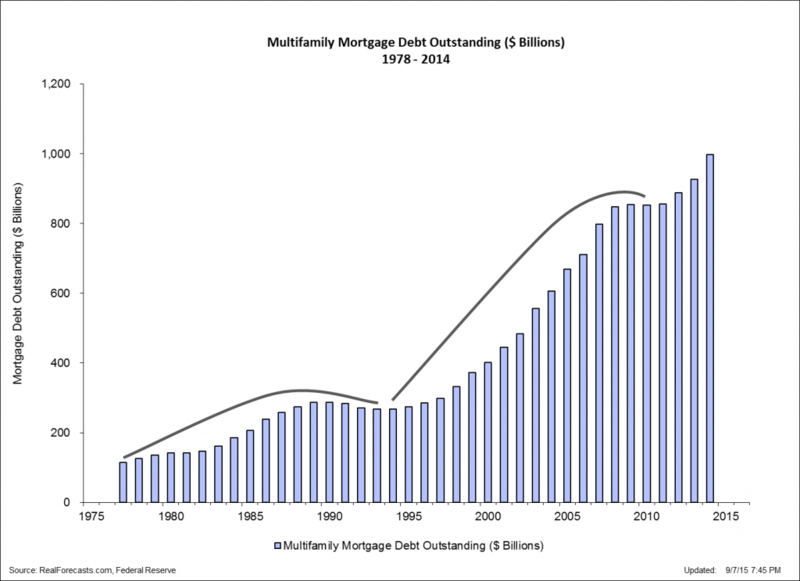 Figure 4 presents the year-over-year growth rate of multifamily mortgage debt since 1978. 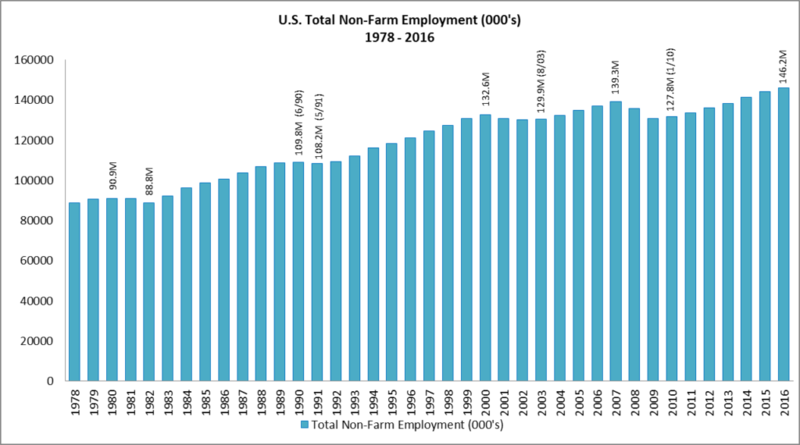 Although the rate of growth averaged only 6.1% from 1978 to 2014. growth accelerated to 12.2% in 1999 and 2007 and 15% in 2003. Finally, Figure 5 shows single family mortgage debt outstanding from 1978 to 2014. The most recent cycle for single family mortgage debt began in 1995 at a level of $3.45 trillion before peaking in 2007 at a level of $11.24 trillion — an increase of 226%. 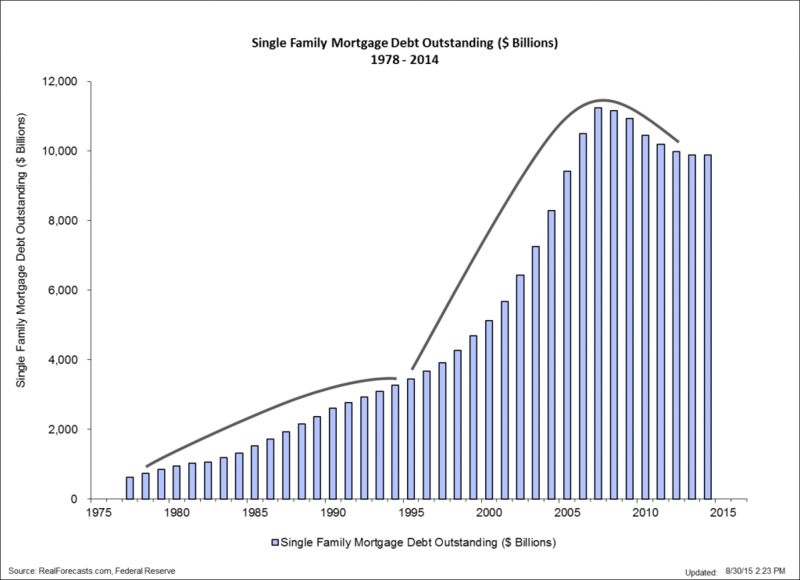 Single family mortgage debt outstanding contracted significantly after the Great Financial Crisis, decreasing to $9.89 trillion at the end of 2014. At this point, it’s not clear whether the last cycle has ended and the new cycle has begun. Regardless, it will still be a number of years before single family mortgage debt outstanding returns to its 2007 peak. Figure 6 presents the year-over-year growth rate of single family mortgage debt outstanding since 1978. Not only did the rate of growth average almost 8% from 1978 to 2014. growth accelerated to as high as 15.5% in 1985 and 14.3% in 2004. 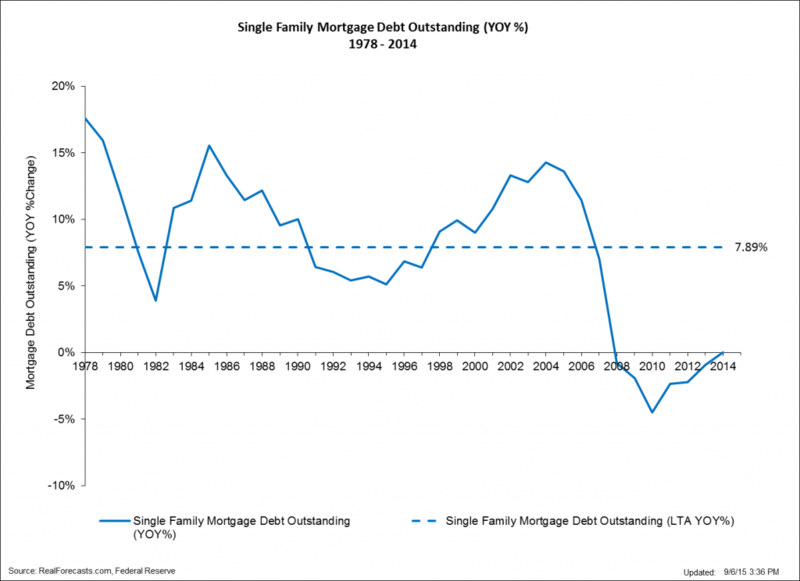 Perhaps even more importantly, in the last year of the cycle that ended in 1995, single family mortgage debt outstanding never contracted and in fact grew at a rate of 5.1%. Comparing Figure 6 to Figure 4 and Figure 2 shows that the multifamily mortgage market is much farther along in its current cycle than either the commercial mortgage market or the single family mortgage market. The marked difference in size between the single family mortgage debt market and the multifamily mortgage debt market — the single family mortgage debt market is approximately 10 times the size of the multifamily mortgage debt market — may help to explain the accelerated growth in multifamily mortgage debt outstanding since 2010. Government Sponsored Enterprises (GSE’s) like Fannie Mae and Freddie Mac are not only the largest source of lending capital for single-family homes, but they are also the largest source of lending capital for apartment homes. The Fed’s attempt to re-inflate the single-family residential market by acquiring residential mortgage-backed securities from Fannie Mae and Freddie Mac has arguably had the unintended consequence of flooding the multifamily residential market with an over-abundance of inexpensive mortgage debt. This in turn could result in the over-building and over-supply of apartment homes. Recently, real estate pundits have been speculating about the impact of the Fed’s expected increase in the Fed Funds Target Rate on real estate mortgage rates and real estate cap rates. Mostly overlooked in this discussion is the impact of an increase in the level of mortgage debt outstanding on cap rates. To that point, Figure 7 compares the NCREIF Property Index (NPI) Income Return — as a proxy for cap rates on commercial and multifamily properties — to commercial and multifamily mortgage debt outstanding from 1978 to 2014. 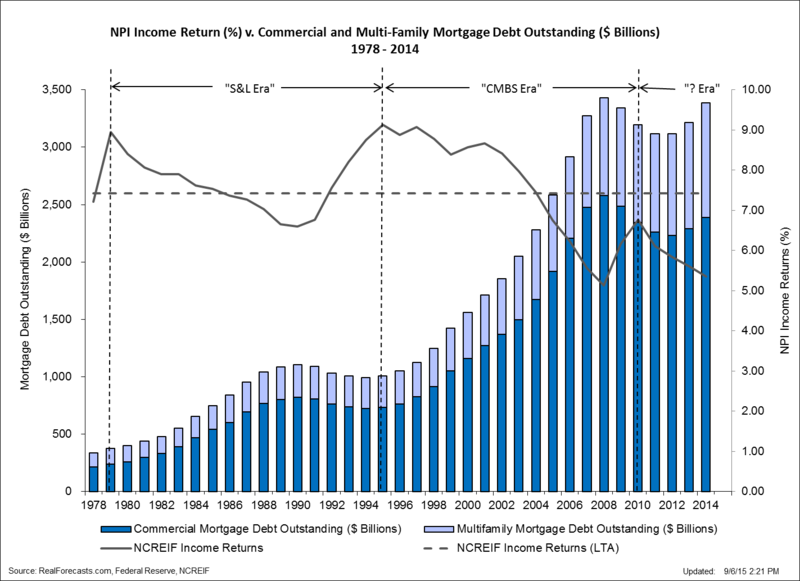 Note the strong inverse correlation between the NPI Income Return and the level of commercial and multifamily residential mortgage debt outstanding. For example, as commercial and multifamily mortgage debt outstanding increased from $374.4 billion in 1979 to $1.11 trillion in 1990, the NPI Income Return decreased from 8.95% to 6.59%. Then, as commercial and multifamily mortgage debt outstanding contracted from $1.11 trillion in 1990 to $990.9 billion in 1994, the NPI Income Return increased from 6.59% in 1990 to 9.13% in 1995. 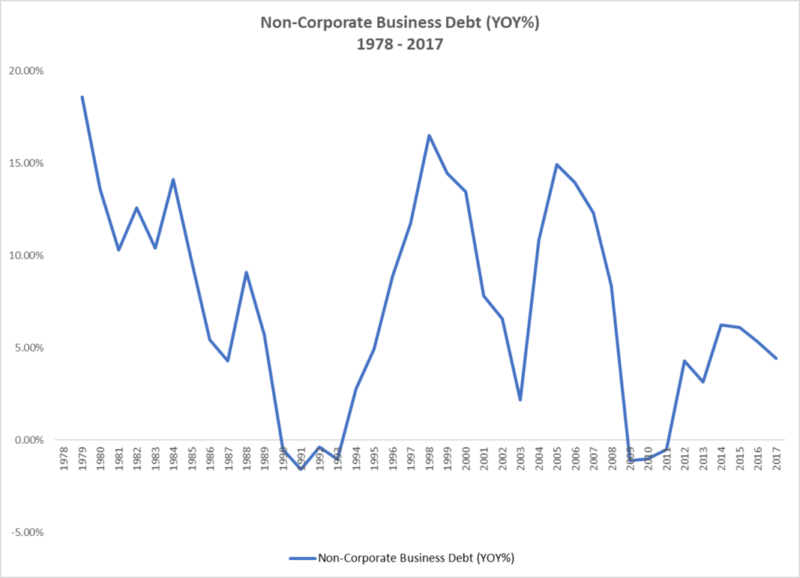 The credit cycle during the 17-year period from 1979 to 1995 has been referred to as the “S&L Era” to reflect the new sources of commercial and multifamily mortgage debt outstanding during that time frame. As commercial and multifamily mortgage debt outstanding increased from $1.08 trillion in 1995 to $3.4 trillion in 2008, the NPI Income Return decreased from 9.13% to 5.13%. Then, as commercial and multifamily mortgage debt outstanding contracted from $3.4 trillion in 2008 to $3.1 trillion in 2011, the NPI Income Return increased from 5.13% in 2008 to 6.76% in 2010. 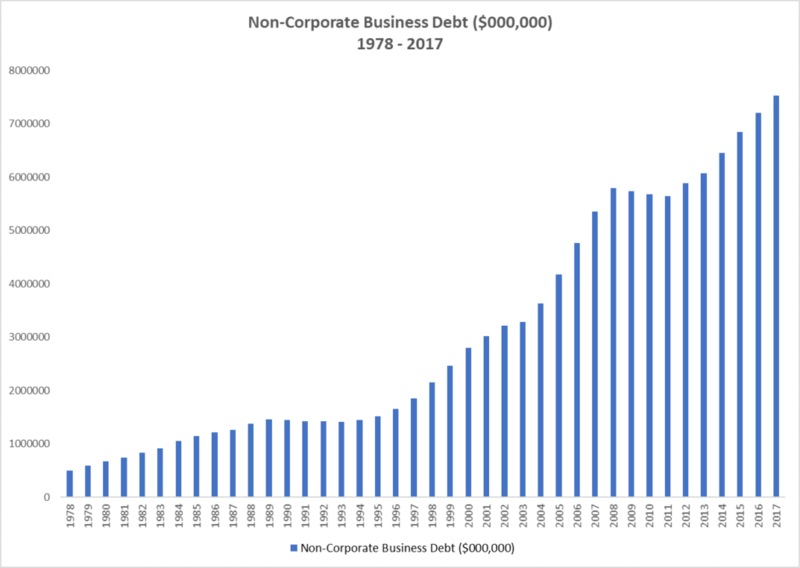 The credit cycle during the 16-year period from 1995 to 2010 has been referred to as the “CMBS Era”, again to reflect the new sources of commercial and multifamily mortgage debt outstanding during that period. 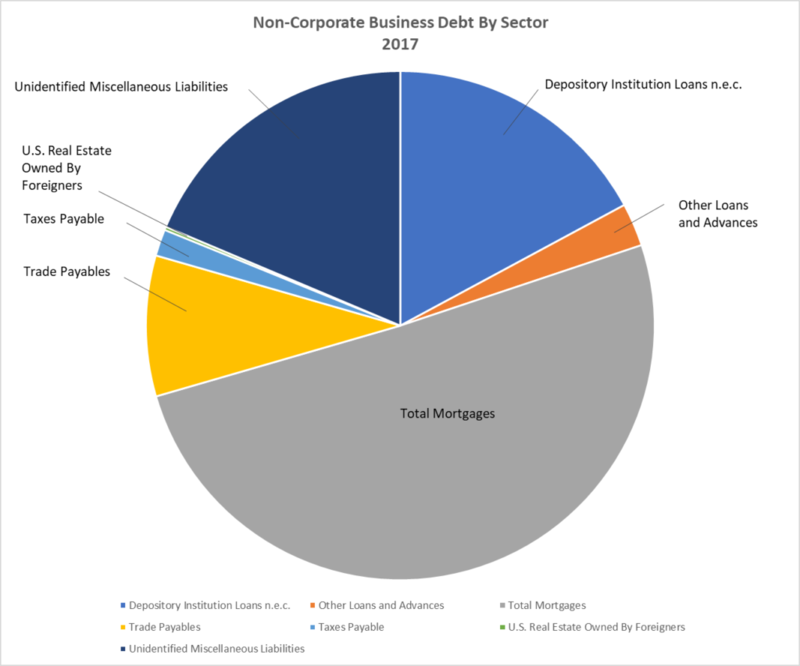 Since the beginning of the current real estate credit cycle, commercial and multifamily mortgage debt outstanding has increased from $3.12 trillion in 2011 to $3.38 trillion in 2014. In turn, the NPI Income Return has decreased from 6.76% in 2010 to 5.36% in 2014. Although it is hard to believe that it can go much lower, this analysis suggests that the NPI Income Return will in fact continue to trend downward as commercial and multifamily mortgage debt outstanding continues to increase during the current real estate credit cycle. 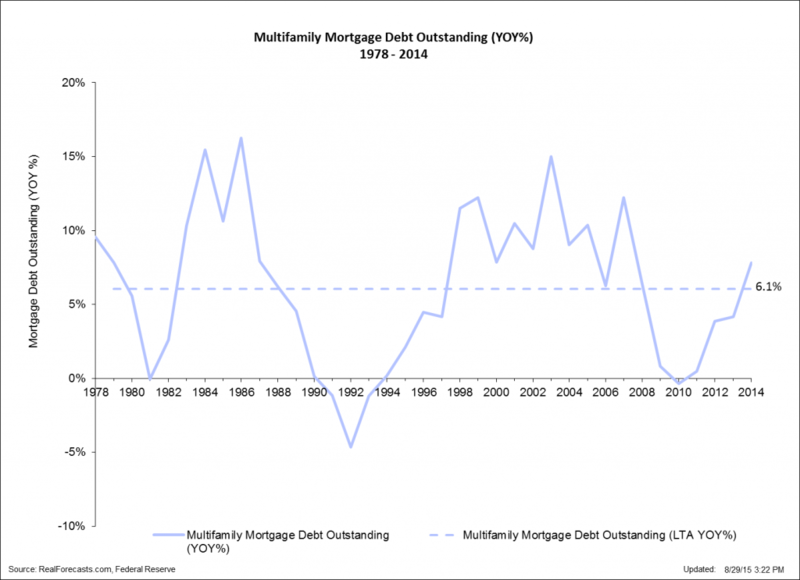 It’s less clear at this point, however, what will be the new sources of commercial and multifamily mortgage debt outstanding during the current cycle. Those that are suggesting that this will become know as the “Shadow Banking Era” — referring to non-chartered lending institutions — could be on the right track. This entry was posted in Economics, Finance, Investment Strategy, Market Forecasts, Real Estate on September 13, 2015 by Jeff Peshut. Can Real Estate Investors Manage Through The Boom/Bust Cycle? With the growth rate of the True Money Supply (TMS) expected to continue its inexorable decline towards the next financial crisis, what steps can real estate investors take to manage through the bust phase of the cycle? This post will address that question. Whatever the case, firms like Wagenseller law will most likely be very busy in the coming months with a heap of litigation cases. But first, let’s take a look at what’s been happening with the TMS growth rate over the past several months. For June, 2015, the year-over-year growth rate of TMS was 8.26%. (See Figure 1) This was up from 7.72% in the previous month and the highest level reported since the end of the QE3 “Taper” in October of 2014. The lowest level reported since October was 6.53% in March of this year. Despite this recent uptick, RealForecasts.com expects the growth rate of TMS to continue the downward trend shown by the arrow in Figure 1, especially once the FOMC raises the Fed Funds Target Rate above its current ceiling of 25 bps later this year. 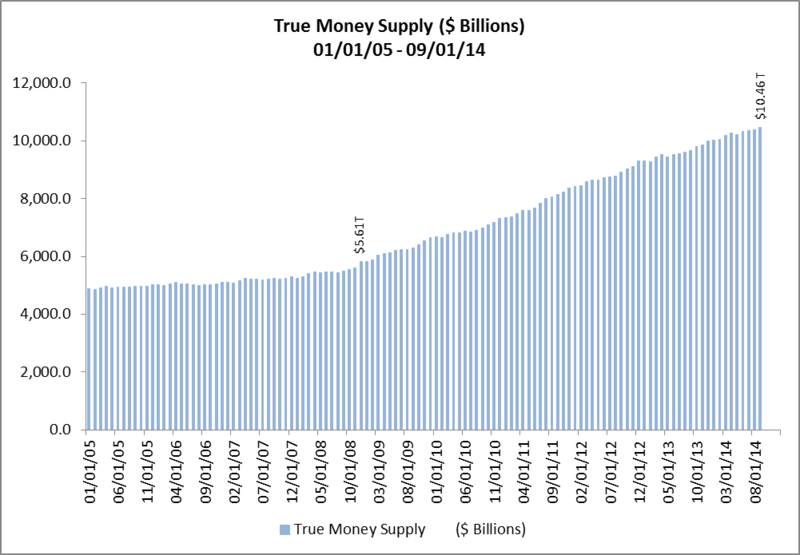 For a more in-depth discussion see, How Will The End Of Quantitative Easing Impact The True Money Supply Growth Rate? What Steps Can Real Estate Investors Take To Manage Through The Next Bust? The two most important steps that real estate investors can take to manage through the next bust is to first shift the way they look at the economy and financial markets from “linear” to “cyclical” and then shift their investment mindset from “relative” to “absolute”. The use of marketing would be a good step forward for the field of real estate. There are so many marketing ideas for real estate, as the main focus revolves around the idea of connecting with customers. What better way to do this than through the use of the internet and marketing tools. Real estate investment is not something that something to be taken lightly. In fact, seeking advice from experts should also be sought prior to any decision being made. Anyone who feels they would need financial assistance prior to investing might like to speak to a Charlotte hard money lender. Research is critical when making such a monumental decision. It’s human nature to forecast in a linear fashion. If the economy and financial markets are going up, it’s natural for investors to forecast that they will stay up and even continue to go up in the future. If the economy and financial markets are going down, it’s also natural for investors to forecast that they will stay down and even continue to go down in the future. Yet the economy and financial markets don’t behave that way. They are nothing if not cyclical. Also, most investors — especially institutional investors — have adopted a relative return mindset for their portfolios and measure their performance and the performance of their investment managers against market benchmarks or indices. A relative return strategy performs well, however, only when the overall market performs well. That said, if the overall market doesn’t perform well, but the investor or manager outperforms the market benchmark or index, they are still deemed to have performed well. That sounds good in theory, but as the saying goes, “you can’t eat relative performance”. Practically speaking, even if an investor’s negative returns weren’t as great as the negative returns posted by the market as a whole, they still lost money. A portfolio based upon an absolute return strategy, on the other hand, is designed to provide positive returns regardless of the direction of the overall market. Investors following an absolute return strategy will generate these positive returns by investing up and down the real estate capital structure (common equity to senior debt) and back and forth along the real estate risk/return continuum (core to opportunistic), depending upon where the real estate capital markets and real estate property markets are in their cycles. 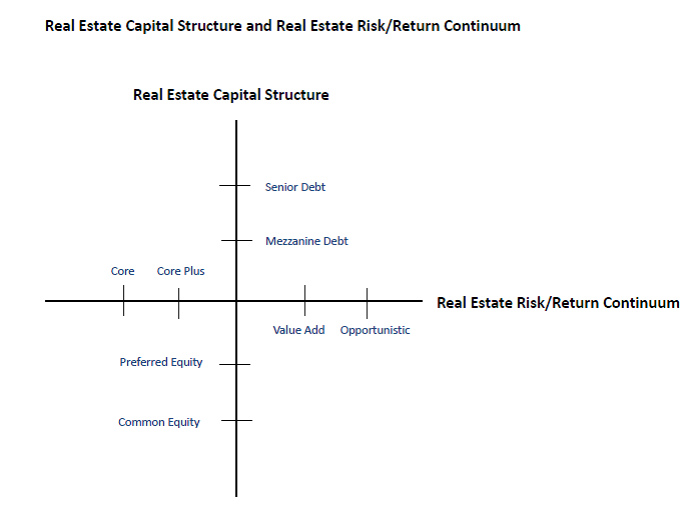 Figure 2 shows the universe of investment alternatives available to real estate investors by the risk profile of the investment and the investor’s position in the capital structure for the investment. The following section indicates where investors should position themselves in the capital structure based upon where the Real Estate Capital Markets are in their cycle. If the Real Estate Capital Markets are either currently in or forecasted to move into the Expansion phase of the cycle, invest in real estate equity investments to take advantage of cap rate compression and appreciating capital values. If the Real Estate Capital Markets are in or forecasted to move into the Contraction phase of the cycle, rotate out of equity investments and into real estate debt investments to avoid cap rate decompression and depreciating capital values. (See Figure 3) Depending upon the investor’s risk tolerance and return objectives, equity investments can take the form of either preferred equity or common equity. Debt investments can take the form of senior debt or mezzanine debt. The following section indicates where investors should position themselves on the real estate risk/return continuum based upon where the Real Estate Leasing Markets are in their cycle. RealForecasts.com expects that the growth of TMS will continue its downward trend in the months ahead, especially once the FOMC raises the Fed Funds Target Rate above its current ceiling of 25 bps later this year. Based upon the current trajectory of this trend, and the Fed’s current policy stance, it looks like the next credit crisis could occur during the second half of 2016. Of course, this forecast could change if the Fed changes its policy stance or if the commercial banks change the pace of lending activity. In the meantime, it’s not too early for real estate investors to take advantage of the robust capital markets environment to begin selling some of their under-performing and less-strategic assets and using the proceeds to reduce the leverage on their portfolios. By “dealing from the bottom of the deck” and reducing leverage, they will be improving the risk profile of their portfolios in anticipation of — and not in reaction to — the next downturn. Many thanks to Michael Pollaro at The Contrarian Take for the TMS data used in this post. 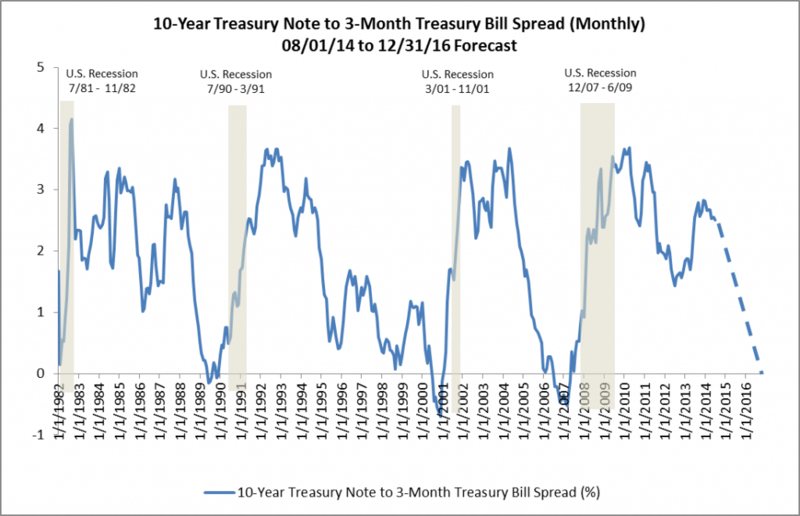 This entry was posted in Economics, Finance, Investment Strategy, Market Forecasts, Real Estate on August 2, 2015 by Jeff Peshut. Has The Fed Been Raising The Fed Funds Rate Under The Radar? At its March 18th meeting, the Federal Open Market Committee (“FOMC”) withdrew its pledge to be “patient” about raising the Fed Funds Target Rate above its current target range of 0 to 25 basis points, thus ending “forward guidance” about its policy stance and allowing the FOMC more freedom and flexibility about the timing of a rate increase. The FOMC indicated that as long as the employment market continues to improve, the FOMC will raise the Fed Funds Target Rate once it becomes “reasonably confident” that inflation will approach 2% over the medium term. The FOMC added that a rate increase remained “unlikely” at its April meeting and said its change in rate guidance does not mean it has decided on the timing for a rate hike. Fed Chair Janet Yellen later told reporters that a June move could not be ruled out. Notwithstanding the FOMC’s statement – and despite the keen attention paid to it by Fed watchers — one question that no one seems to be asking is whether the Fed has already been raising the Fed Funds Rate under the radar. This post addresses that question. Before addressing it, however, let’s first review some monetary policy basics. 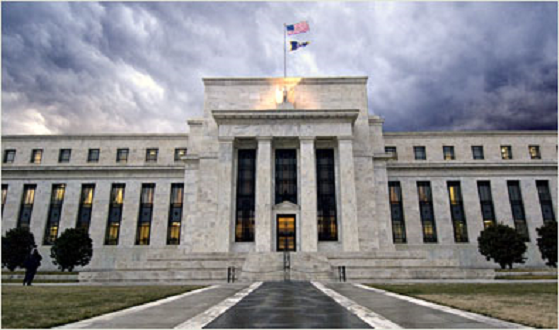 The Federal Reserve uses monetary policy to influence the supply of money and credit in the U.S. economy. 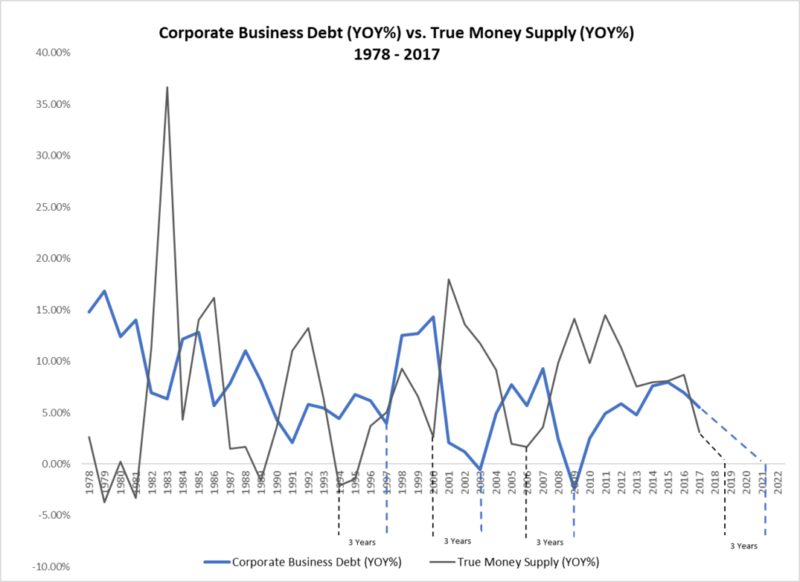 The supply of money and credit, in turn, affects interest rates and the performance of the U.S. economy and financial markets. Fed Funds Rate – The average rate at which a depository institution (DI) — or other eligible entity such as a foreign bank or government sponsored enterprise — makes an unsecured overnight loan of U.S. dollars to another DI (“Fed Funds Transaction”). A DI borrows money overnight from another DI to maintain its reserve balances or clear financial transactions. The Discount Rate – The rate charged by Federal Reserve Banks to depository institutions (DIs) on short-term loans. The Reserve Requirement – The reserve requirement is the percentage of its customer deposits that each DI must hold as reserves – rather than lend out – either in their vaults or on deposit at a Federal Reserve Bank. Since October of 2008 the Fed has been using the payment of interest on reserves as a fourth policy tool and from December of 2008 to October of 2014 the Fed used Quantitative Easing (“QE”) as a fifth tool. Up until the fourth quarter of 2008 — when the Fed adopted a Zero Interest Rate Policy (ZIRP), reduced the Fed Funds Target Rate to nearly zero, began paying interest on reserves and initiated QE – raising and lowering the Fed Funds Rate had been the Fed’s primary policy tool. To implement its monetary policy, the FOMC would set a target level or range for the Fed Funds Rate consistent with the desired level of reserves and then use its open market operations to influence the reserve balances until the Fed Funds Effective Rate reached its target rate. The Fed’s open market operations influence reserve balances by purchasing and selling financial instruments — which are usually securities issued by the U.S. Treasury, Federal agencies and government-sponsored enterprises (GSEs) — in the “open market”. Open market operations are carried out by the Domestic Trading Desk of the Federal Reserve Bank of New York under direction from the FOMC. The transactions are executed through a cadre of security dealers that the Fed regularly does business with, which are known as “primary dealers”. When the Fed wants to increase reserves and thereby lower the Fed Funds Effective Rate, it buys securities and pays for them by making a deposit to the account maintained at the Fed by the primary dealer’s bank. When the Fed wants to reduce reserves and thereby raise the Fed Funds Effective Rate, it sells securities and makes a withdrawal from these accounts. Most of the time, the Fed does not want to permanently increase or decrease reserves, so it reverses these transactions within several days. Figure 1 illustrates how changes in reserve balances influenced the Fed Funds Effective Rate from the beginning of 1985 through the third quarter of 2008. 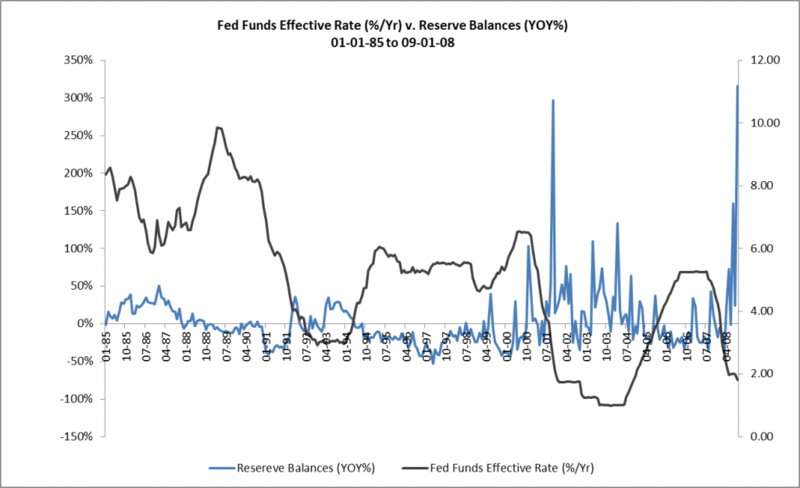 When reserve balances decreased, the Fed Funds Effective Rate increased and when reserve balances increased, the Fed Funds Effective Rate clearly decreased. 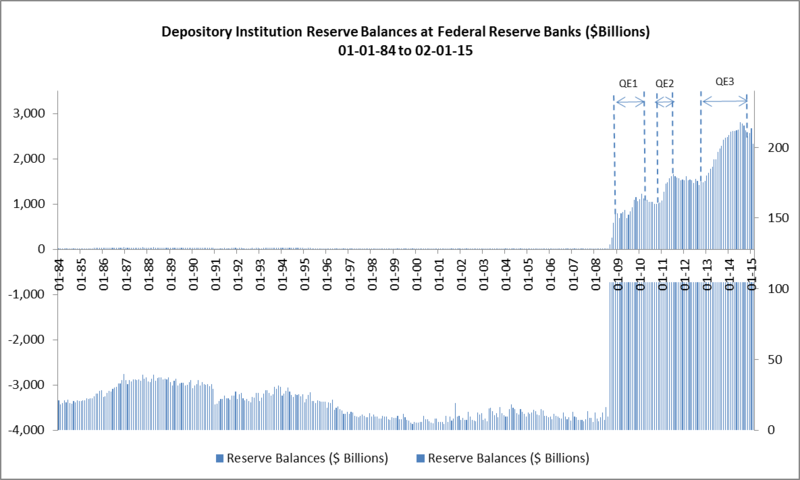 How Did Quantitative Easing Impact Reserve Balances? Once the Fed lowered the target Fed Funds Target Rate into the 0 to 25 bps range, QE replaced the Fed Funds Rate as the Fed’s primary policy tool. 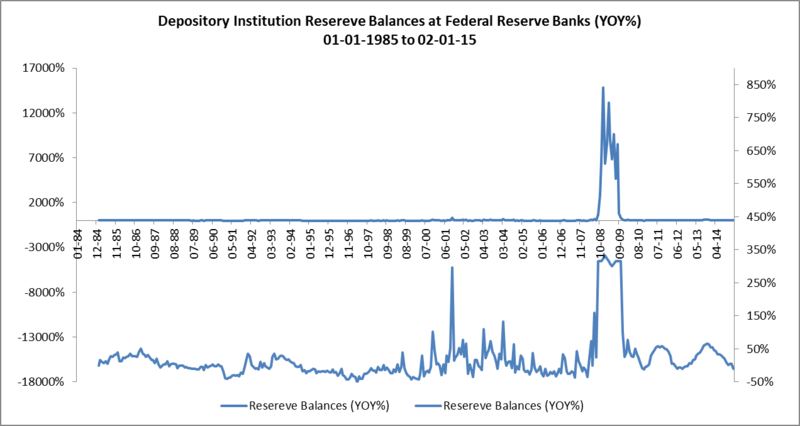 The impact on reserve balances was both immediate and remarkable. (See Figure 2.) Because the increase was so great, I’ve used a panel chart to be able to see the reserve balances before QE and the reserve balances after QE on the same chart. Reserve balances went from $847.82 billion at the beginning of QE1 in December of 2008 to $1.12 trillion at the end of QE1 in March of 2010, to $1.62 trillion at the end of QE2 in June of 2011 and to $2.63 trillion at the end of QE3 in October of 2014. The greatest increase in reserves on a on a year-over-year percentage basis actually occurred in the year leading up to QE1 when reserve balances went from a mere $5.67 billion in December of 2007 to the previously mentioned $847.82 billion in December of 2008, a head-spinning year-over-year increase of over 14,800%! (See Figure 3.) Again, a panel chart allows us to see the year-over-year percentage change before QE and the year-over-year percentage change after QE on the same chart. Why Did The Fed Start Paying Interest On Reserves? The aggressive expansion of the Fed’s various liquidity facilities caused a large increase in excess reserve balances that placed extraordinary downward pressure on the Fed Funds Effective Rate. This made it difficult for the Fed to achieve the operating target for the Federal Funds Rate set by the FOMC. According to the Fed, paying interest on reserves allowed it to increase the level of reserves and still maintain control of the Federal Funds Rate. Because depository institutions have little incentive to lend in the overnight inter-bank Fed Funds market at rates below the interest rate on excess reserves, paying interest on reserves allows the Fed to effectively place a floor on the Fed Funds Rate. This floor allows the Fed to keep the Fed Funds Effective Rate closer to its target rate than it would have been otherwise able to. Some commentators argue that once the Fed began paying interest on reserves and reduced the Fed Funds Target Rate to a range of 0 to 25 bps, it effectively decoupled changes in the Fed Funds Effective Rate from changes in reserve balances in the banking system. They say that the Fed can now adjust reserve balances independently of the Fed Funds Effective Rate and that therefore the Fed Funds Rate is no longer a relevant policy tool. As a result, they believe that the keen attention that people are paying to the timing of the Fed’s increase in the Fed Funds Rate is misplaced. At first glance, Figure 4 would seem to support these commentators’ argument. From December 2008 until today, the Fed Funds Effective Rate has been range bound between 0 and 25 bps while reserve balances have been growing at exponential rates. If we zoom into the portion of the chart that relates to the period after QE1, which ended in March of 2010, we see that the relationship between changes in reserve balances and changes in the Fed Funds Effective Rate is as strong as it has ever been. (See Figure 5.) The changes in the Fed Funds Effective Rate are just occurring on a much smaller scale! We also see that the Fed’s “Taper” policy that began at the beginning of 2014 has reduced reserve balances from a high of $2.8 trillion in July of 2014 to $2.3 trillion in February of this year — a reduction of 18% in eight months. This decrease in reserve balances has raised the Fed Funds Effective Rate from 7 bps in January of 2014 to 11 bps in February of this year — an increase of more than 57% in a little over a year. So, to answer the question raised at the beginning of this post, the Fed has indeed been raising the Fed Funds Effective Rate under the radar since January of 2014. They’ve just been using the tapering of Quantitative Easing to reduce reserve balances instead of the more traditional method of raising the Fed Funds Target Rate. 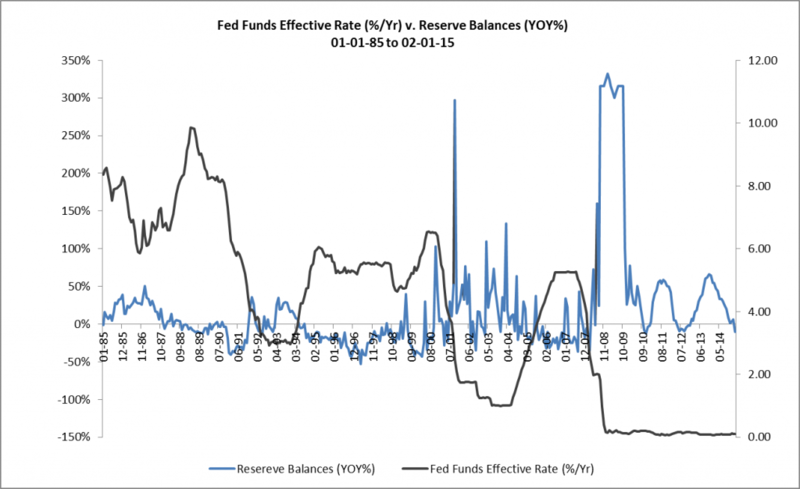 What’s Next For Reserve Balances and The Fed Funds Rate? 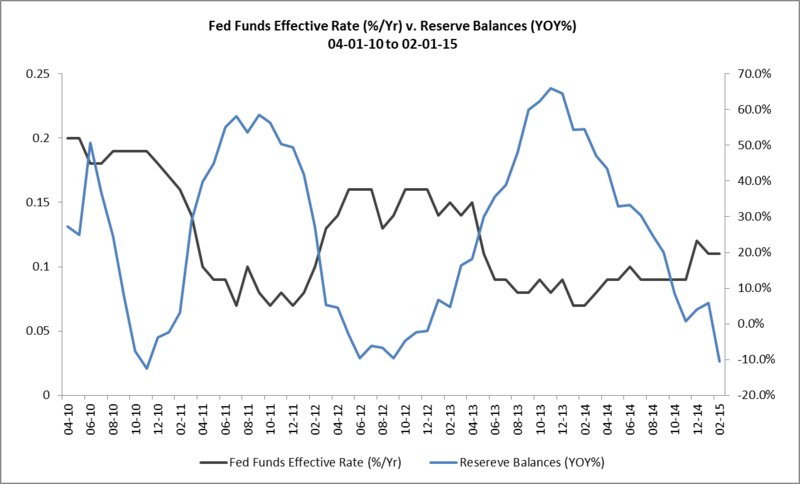 To continue to raise the Fed Funds Effective Rate, watch for the Fed to reduce reserve balances in the months ahead. It’s unlikely that the Fed will begin to raise the Fed Funds Target Rate until the Fed Funds Effective Rate approaches 25 bps, the upper limit of its current target range for the Fed Funds Rate. Once the Fed does raise the Fed Funds Target Rate, the Fed Funds Rate should retake its place as the Fed’s primary policy tool and we’ll once again be able to pick up changes in the Fed Funds Rate on our radar screens. This entry was posted in Economics, Investment Strategy, Market Forecasts, Money on March 26, 2015 by Jeff Peshut. 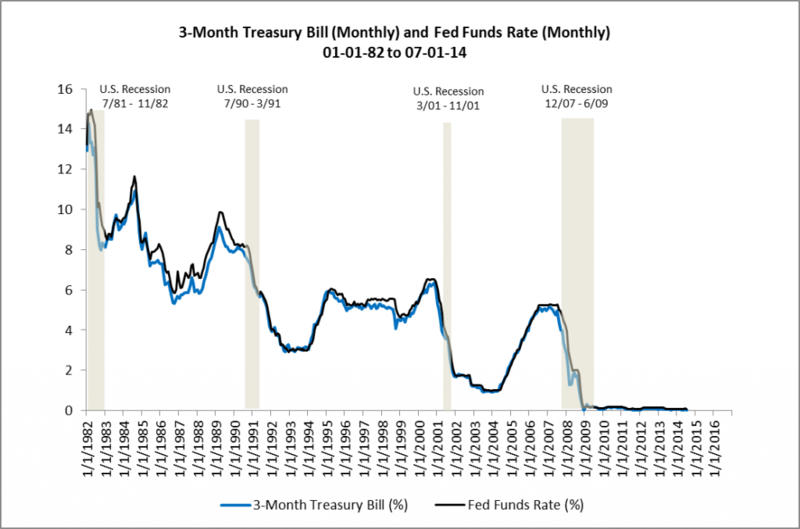 When Will The Fed Begin Raising The Fed Funds Rate? In its press release about its December 17th meeting, the Federal Open Market Committee (“FOMC”) shifted its language about how long it will maintain the target Fed Funds Rate in the 0 to 1/4% range from “considerable time” to “it can be patient”. Most Fed watchers have been focused on the first increase in the Fed Funds Rate as the sign that the Fed has shifted from a loose policy stance to a tight policy stance. I suggest that the “Taper” that began in January of this year and the end of Quantitative Easing in October were the first phases in a type of monetary tightening that we haven’t seen during our lifetimes and that the tightening everyone has been watching for has been hiding in plain sight throughout 2014. Applying this translation to the current situation, it looks like the FOMC will start raising the Fed Funds Rate at its scheduled meeting in April of 2015. Of course, even though it is unlikely, the Fed could shift its language and policy stance again between now and April. If it does, RealForecasts.com will provided an updated forecast based upon the new information. So, keep checking back with RealForecasts.com for the latest news about the Fed’s actions and what they mean to investors in real assets. This entry was posted in Economics, Investment Strategy, Market Forecasts, Money on December 20, 2014 by Jeff Peshut. What Is So Good About Gold? If the country’s second-wealthiest man has such antipathy toward it, what is so good about gold? Before attempting to answer that question, let’s first take a look at what gold is and what it isn’t. Despite Warren Buffett’s remark about head-scratching Martians, there is nothing mysterious about gold. 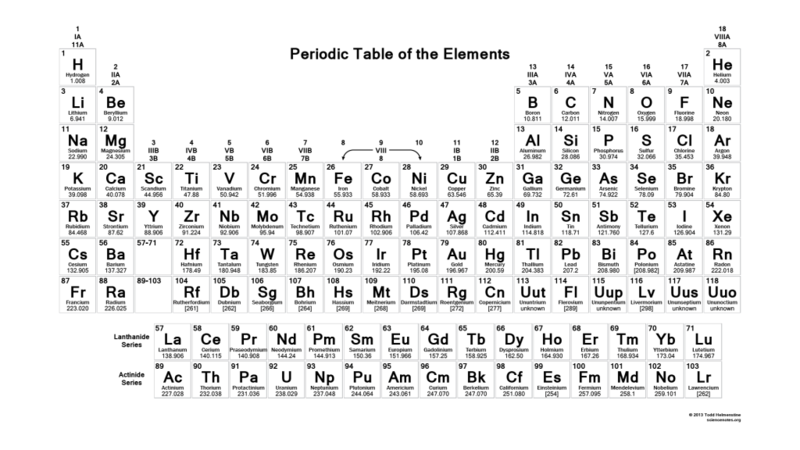 Scientifically speaking, gold is a chemical element with the symbol Au and the atomic number of 79 — between platinum (Pt) and mercury (Hg) and directly below silver (Ag) on the Periodic Table of Elements. (See Figure 1.) It is a bright yellow dense, soft, malleable and ductile metal. People first mined gold about 5,000 years ago. Since that time, we have valued gold for emotional, cultural, political and economic reasons. Because of its emotional, cultural and political significance, gold has been the subject of many beliefs and false beliefs. Although this post will focus on gold’s economic aspects, it will also attempt to dispel some of the confusion and false beliefs surrounding it. 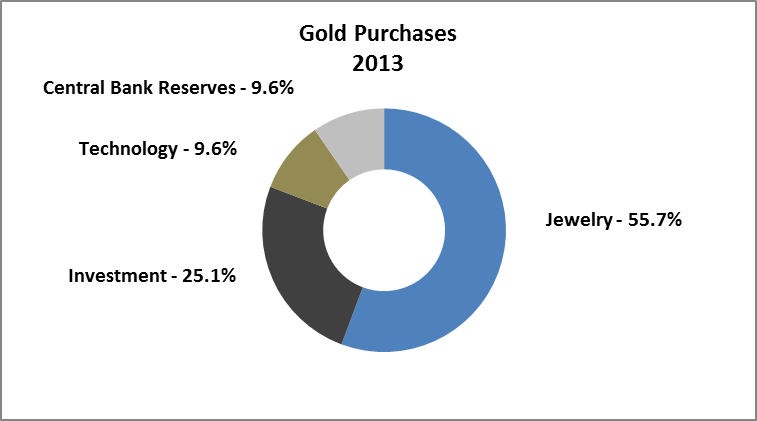 Economically, gold is classified as a commodity, similar to other precious metals such as platinum and silver. According to the World Gold Council, there were 177,200 tonnes of gold stock in existence above the ground at the end of 2013. Approximately 3,000 tonnes of new gold is mined each year, an increase in the gold stock of only 1.5% to 2.0% per year. East Asia as a whole produces 21 per cent of the total of newly-mined gold. (China is the largest single gold-producing country in the world, accounting for around 14 per cent of total production.) Latin America produces around 18 per cent of the total, with North America supplying around 15 per cent. Around 19 per cent of production comes from Africa and 5 per cent from Central Asia and Eastern Europe. Much of the confusion surrounding gold today stems from its historical role as money. The World Gold Council provides a comprehensive overview of gold’s role in the monetary system. A summary of the WGC’s overview follows. Gold coins were first struck on the order of King Croesus of Lydia (an area that is now part of Turkey around 550 BC. Gold coins circulated as currency in many countries before the introduction of paper money. Once paper money was introduced, currencies still maintained an explicit link to gold, with the paper being exchangeable for gold on demand. By the late 19th Century, many of the world’s major currencies were fixed to gold at a set price per ounce, under the so-called Gold Standard. Under the Gold Standard, nearly all countries either fixed the value of their currencies in terms of a specified amount of gold, or linked their currency to that of a country that did so. Domestic currencies were freely convertible into gold at the fixed price and there was no restriction on the import or export of gold. Gold coins circulated as domestic currency alongside coins of other metals and notes, with the composition varying by country. Because each currency was fixed in terms of gold, exchange rates between participating currencies were also fixed. The classical Gold Standard existed for only about 40 years — from the 1870s until the outbreak of World War I in 1914. By 1900 all countries apart from China, and some Central American countries, were on a Gold Standard. The Gold Standard broke down at the outset of WW I as countries resorted to inflationary policies to finance the war and, later, reconstruction efforts. In practice, only the U.S. remained on the gold standard during the war. Periodic attempts to return to a pure classical Gold Standard were made during the inter-war period, but none survived past the Great Depression. During World War II, many believed that a new international system would be needed after the war ended to replace the Gold Standard. The design for the new system was drawn up at the Bretton Woods Conference — named after the town in New Hampshire in which it took place — in 1944. The Bretton Woods system fixed the dollar to gold at the existing parity of US$35 per ounce, while all other currencies had fixed, but adjustable, exchange rates to the dollar. In March 1968, a two-tier gold market was introduced with a freely floating private market, but with official transactions at the fixed parity of US$35 per ounce. Finally in August 1971, President Nixon announced that the U.S. would end on-demand convertibility of the dollar into gold for the central banks of other nations. The Bretton Woods system collapsed and gold traded freely on the world’s markets. To determine gold’s status as money today, we must first define money. According to Austrian School economists, the defining characteristic of money is its use as a medium of exchange. If Austrian School economists considered gold to be a medium of exchange today, they’d be including it in their calculation of the money supply. During periods in which gold coins circulated as part of a country’s currency and these currencies were freely convertible into gold held by central banks at a fixed price under the Gold Standard, gold was used a medium of exchange, was part of Base Money and thus was a part of the money supply. Gold was money. Today, gold coins are no longer circulating as currency and are therefore no longer a medium of exchange. 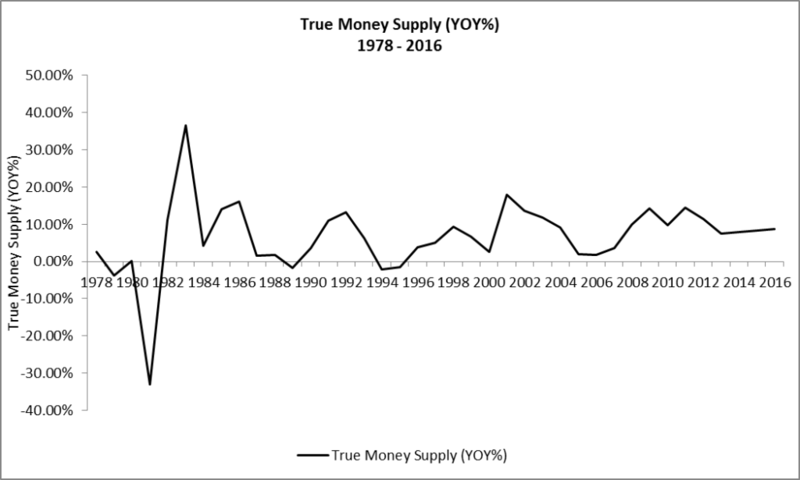 Further, since the collapse of the Bretton Woods System, gold is no longer part of Base Money and therefore is not part of the money supply. As a result, it is no longer accurate to characterize gold as money. All that said, many investors purchase gold as a hedge against the debasement and possible collapse of a fiat currency. They believe that gold will regain its status as money If the fiat currency collapses. Because of gold’s potential to become an integral part of the monetary system once again, a case can be made to characterize gold as “contingent money”. In investment circles, gold is categorized as a “real asset” as compared to a “financial asset”. Real assets are physical or tangible assets that have value, due to their intrinsic qualities and properties. Real assets include precious metals like gold, commodities, real estate, agricultural land and oil. Financial assets or “paper assets” derive their value from a contractual claim. Stocks, bonds and bank deposits are all examples of financial assets. Whether an asset is a good investment, however, depends upon a number of factors such as the investor’s investment style, risk tolerance, investment time horizon and investment objectives. For example, Warren Buffett is generally known as a buy-to-hold “value investor” in the tradition of Benjamin Graham and David Dodd. As the name suggests, value investors buy financial assets that appear under-priced based upon some form of fundamental analysis. It’s not surprising that a value investor like Buffett would eschew a real asset like gold. On the other hand, diversified investors who follow the tenets of Modern Portfolio Theory — as pioneered by Harry Markowitz in the 1950s — are attracted to real assets like gold because they lack correlation with financial assets (such as those tracked by Stocktrades), which allows them to diversify their portfolios and reduce portfolio volatility. Still other investors choose gold as a hedge against both inflation and currency risk. 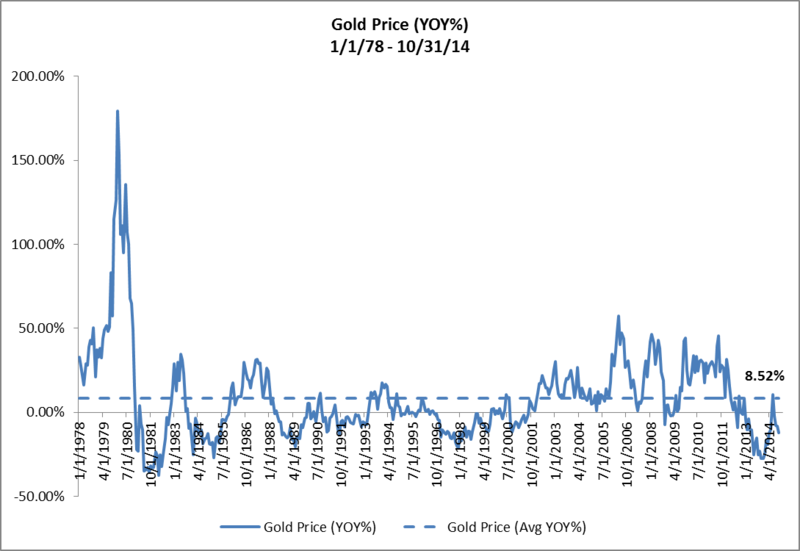 Gold’s usefulness as a hedge against currency risk is illustrated in Figure 5. 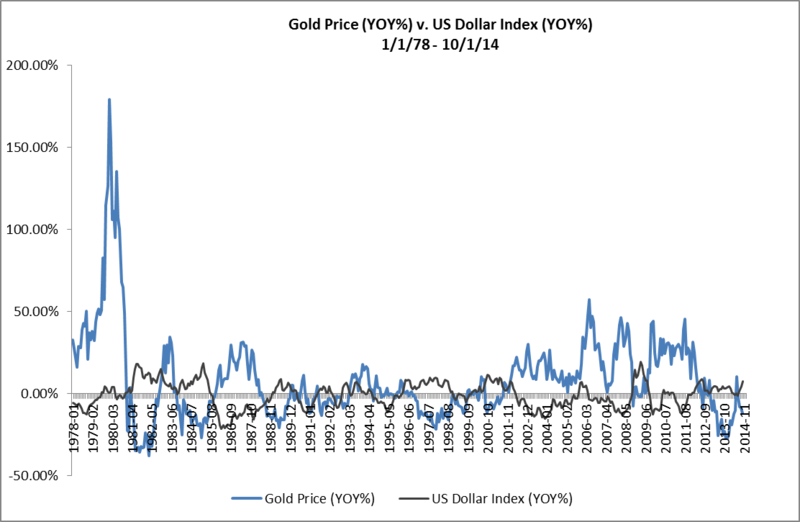 Note the very strong inverse correlation between the growth rate of the gold price and the growth rate of the price of the U.S. Dollar relative to other major currencies. 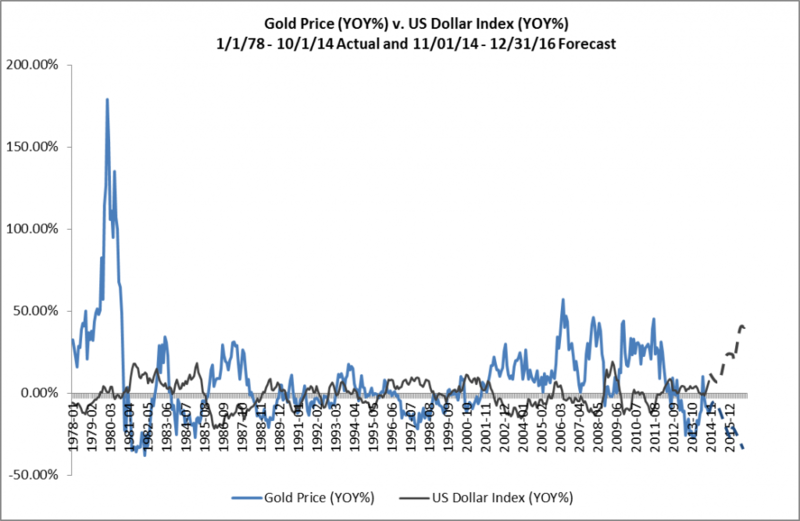 Consistent with Austrian Business Cycle Theory, we can use the growth rate of TMS to forecast the growth rate of both the U.S. Dollar Index and Gold Price. 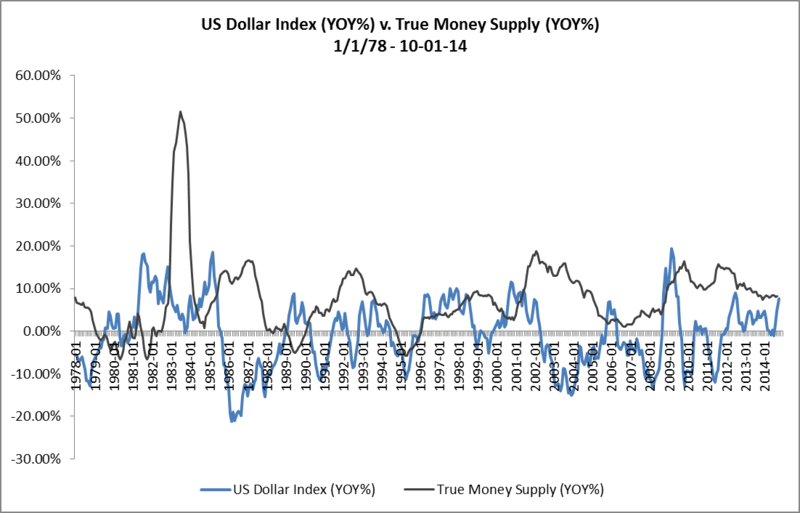 The very strong inverse correlation between the growth rate of the U.S. Dollar Index and the growth rate of the True Money Supply (TMS) is shown in Figure 6. If the Fed expands the U.S. money supply at a faster rate than the central banks of the countries of other major currencies expand their money supply, the laws of supply and demand suggest that the price of the U.S. Dollar should fall relative to the other currencies (all else being equal). Conversely, if the Fed expands the U.S. money supply at a slower rate than the other central banks expand their currencies, the price of the U.S. Dollar should rise relative to the other currencies. The chart in Figure 6 certainly supports these suggestions. When the next financial crisis occurs, however, watch for the Gold Price and the U.S, Dollar Index to reverse, with the growth rate of the U.S. Dollar Index decelerating and even decreasing and the growth rate of the price of gold accelerating sharply. This forecast is not only predicated on the Fed continuing its current policy stance, but also on the other major central banks continuing their policy stances. In the event the Fed or the other central banks adjust their policy stances, it will alsbe necessary to adjust this forecast in light of the changed policies. Continue to check back with RealForecasts.com for future updates. As always, thanks to J. Michael Pollaro, author of The Contrarian Take, for the TMS data used to construct the charts in this article. 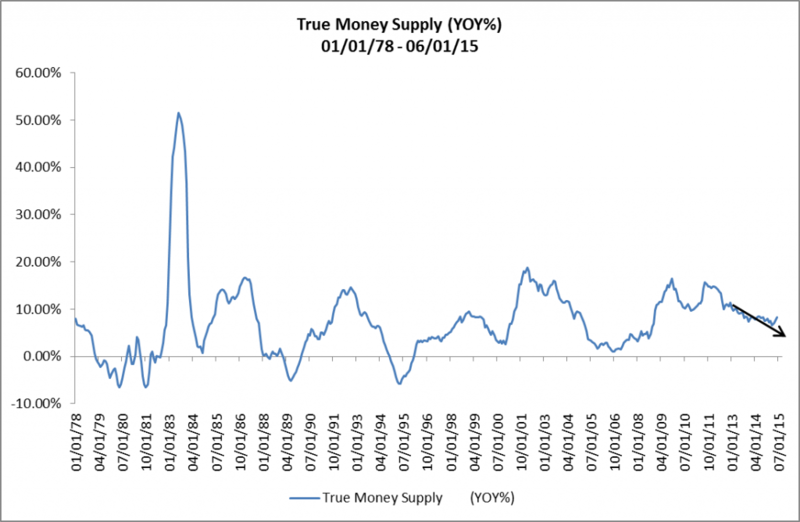 To see more of Michael’s TMS data, go to http://blogs.forbes.com/michaelpollaro/austrian-money-supply/. This entry was posted in Economics, Investment Strategy, Market Forecasts, Money on December 7, 2014 by Jeff Peshut. 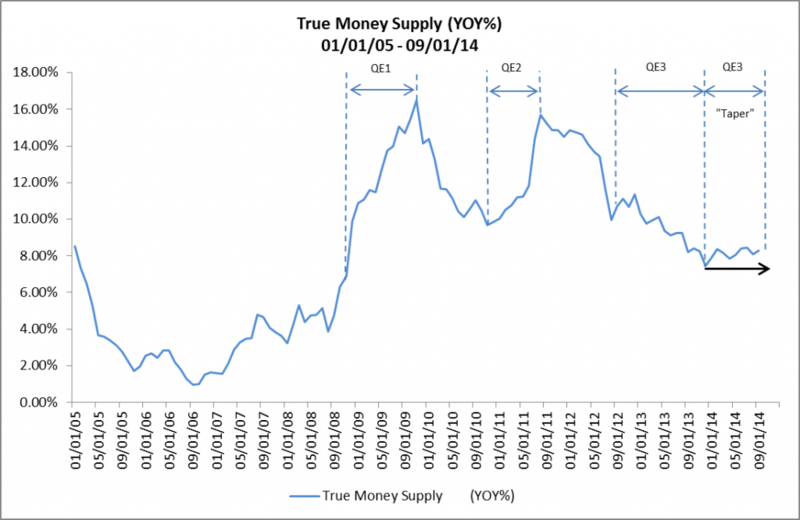 How Will The End Of Quantitative Easing Impact The True Money Supply Growth Rate? On Wednesday October 29th, the Federal Open Market Committee (FOMC) directed the Open Market Trading Desk at the Federal Reserve Bank of New York to conclude its asset purchase program — commonly referred to as Quantitative Easing or QE for short — by the end of October. The FOMC also directed the Open Market Trading Desk to maintain the existing policy of reinvesting principal payments from the Federal Reserve’s holdings of both agency debt and agency MBS into agency MBS and of rolling over maturing Treasury securities at auction. 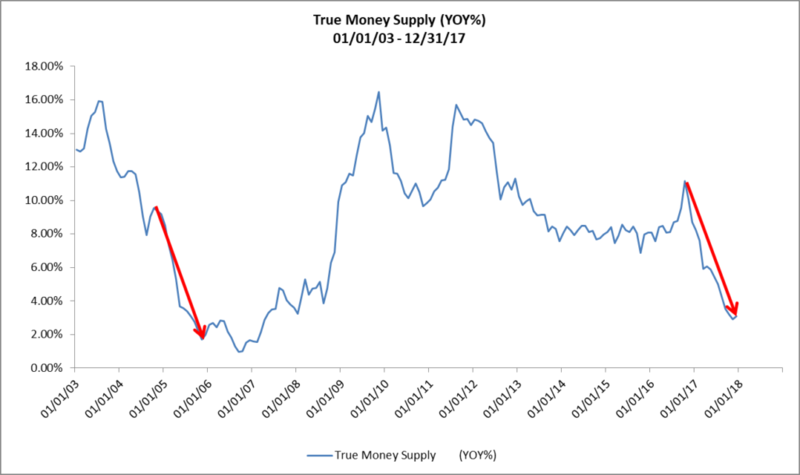 Now that QE has ended, RealForecasts.com will look back to see the impact it has had on the growth and growth rate of the True Money Supply (TMS) and then provide a forecast of the TMS growth rate between now and the end of 2016. 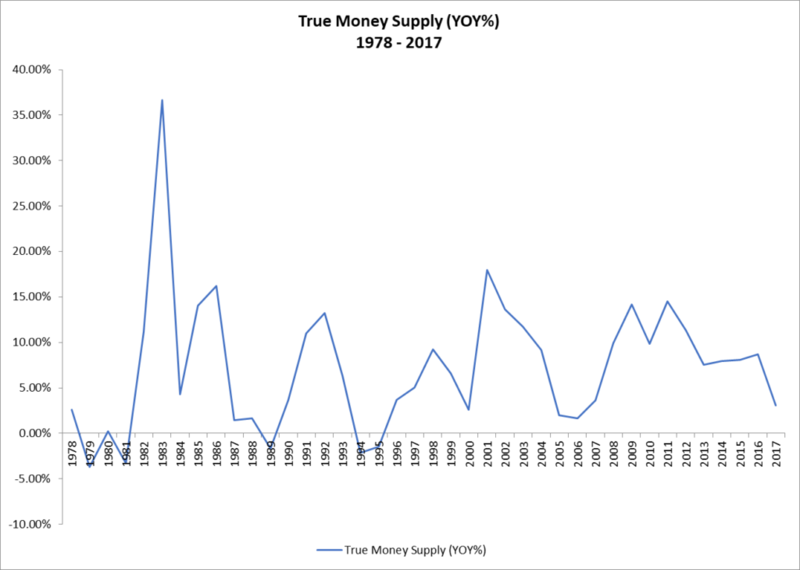 Figure 1: True Money Supply ($ Billions) 1/1/05 – 9/1/14 This represents an increase in TMS of 87.5% over 70 months or an average increase of 15% per year. 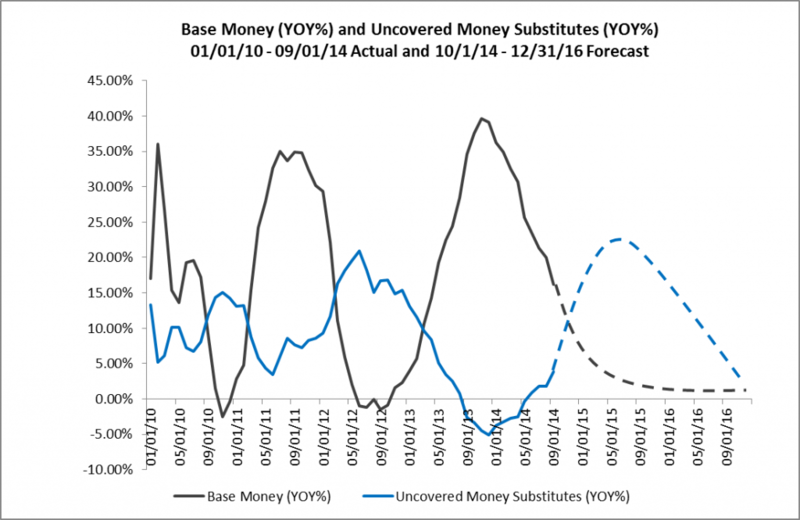 To forecast the growth rate of TMS in a post-QE economy, we need to first separate TMS into its two component parts — Base Money and Uncovered Money Substitutes. 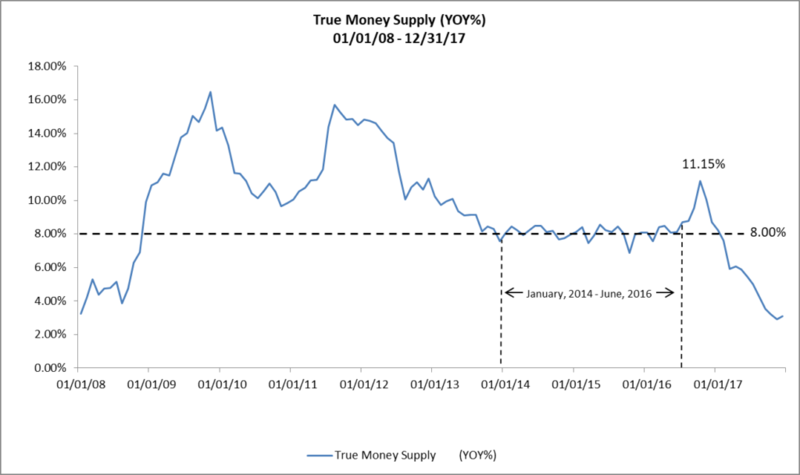 As explained in Is True Money Supply (TMS) Growth Continuing To Decelerate?, Base Money is made up of Currency Outstanding and Reserve Deposits held by the Fed — also known as Covered Money Substitutes. 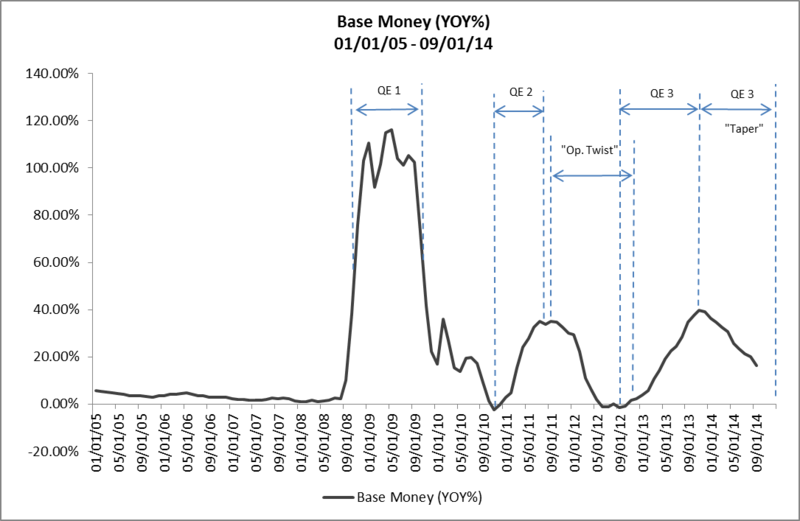 The rate of growth of Base Money is directly related to the level of bond-buying activity by the Fed. The Uncovered Money Substitute portion of TMS is money created by the “pyramiding” of Reserve Deposits through fractional reserve banking. The rate of growth of Uncovered Money Substitutes is directly related to the level of lending by the commercial banks. 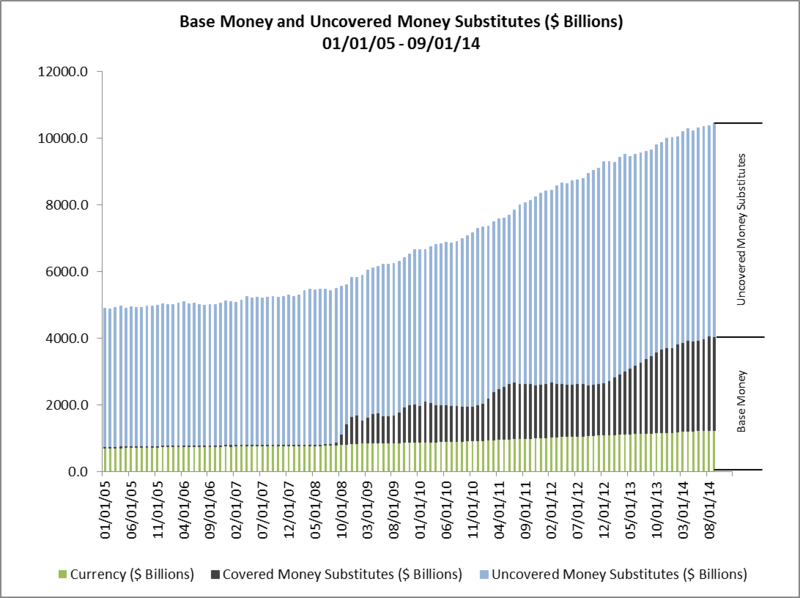 Base Money (Currency and Covered Money Substitutes) and Uncovered Money Substitutes from January of 2005 through September of 2014 are shown in Figure 3. 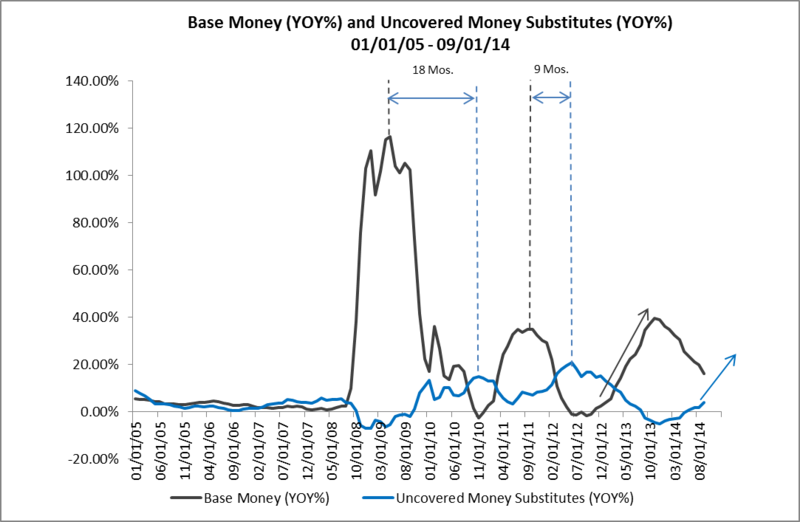 The impact of the Fed’s bond-buying activity on the growth of Base Money is clearly visible in the growth of Covered Money Substitutes beginning in November of 2008. During the almost six-years of Quantitative Easing, three periods of accelerating growth of Base Money stand out — from November of 2008 to September of 2009, from November of 2010 to August of 2011 and from September 2012 to November of 2013. (See Figure 4.) The first period corresponds to most of QE1, while the second and third periods correspond directly to the periods of QE2 and QE3, respectively. So, for now, it looks like the TMS growth rate will remain constant or may even accelerate slightly through mid-year 2015, at which point it will turn downward and continue downward through the end of 2016. Of course, this forecast is predicated on the Fed continuing its current policy stance. In the event the Fed changes its stance, all bets are off and it will be necessary to adjust this forecast in light of the changed policy. Continue to check back with RealForecasts.com for future updates about changes in the TMS growth rate. This entry was posted in Economics, Investment Strategy, Market Forecasts, Money, Real Estate on November 11, 2014 by Jeff Peshut.